Kyle Pozan focuses his practice on a variety of civil matters as a member of the firm’s antitrust, class action, premises liability, product liability, asbestos, automotive and trucking, and business litigation practice groups. Kyle is well-versed in all areas of e-discovery and has used his experience in that field to leverage outstanding results for his clients. Kyle is passionate about giving back to the community, and recently served as a mentor for high school students at a local charter school. Kyle is also a certified mediator and avid writer. 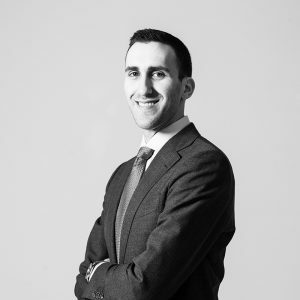 Additionally, he is a member of the Social Committee for the Decalogue Society Young Lawyer’s Division Board. While in law school, Kyle served as an Editor of the Seventh Circuit Review, which published his work. He also served as Vice President and Treasurer of the Real Estate Law Student Association. Kyle lives in Chicago with his wife, Theresa. In re Broiler Chicken Antitrust Litig., No. 1:16-cv-08637 (N.D. Ill.). Firm appointed as liaison counsel in an ongoing antitrust class action on behalf of the direct purchaser plaintiffs against broiler chicken producers. Smith, et al. v. City of Chicago, et al., No. 1:15-cv-03467 (N.D. Ill.). Firm serving as co-lead counsel in an ongoing class action on behalf of the plaintiffs against the City of Chicago for unconstitutional stops and frisks. Wilkins Buick, Inc., et al. v. Mazda Motor of America, Inc., 1:14-cv-02908 (N.D. Ill.). Obtained judgment on the pleadings and secured a dismissal with prejudice for an international automobile manufacturer in a declaratory judgment action. Holmes, et al. v. City of Racine, et al., No. 2:14-cv-00208 (E.D. Wisc.). Successfully represented minority business owners in a Section 1983 lawsuit against the City of Racine. Beal v. Office Depot, Inc., No. 13-sc-008410 (Milwaukee County, WI). Obtained defense verdict following a bench trial for a national retail corporation in case alleging deceit and emotional distress. In re Potash Antitrust Litig. (II), No. 1:08-cv-06910 (N.D. Ill.). Firm appointed as liaison counsel and achieved a recovery of $90 million for the direct purchaser plaintiff class. Obtained summary judgment in personal injury suit on behalf of a construction subcontractor allegedly responsible for unsafe condition of work site. Perrin Conferences Webinar on E-Discovery Essentials for Young Lawyers, Presenter. The Apex Doctrine: Protecting Corporate Executives From Abusive Discovery Practices, International Comparative Legal Guide to Product Liability Journal (2014). LexisNexis Practice Guide: Illinois Personal Injury Litigation,” Editor (2014 Ed.). Scrutinizing the Seventh Circuit: How the Court Failed to Address the “Levels of Scrutiny” Quagmire in United States v. Skoien, 6 Seventh Circuit Rev. 337 (2010).